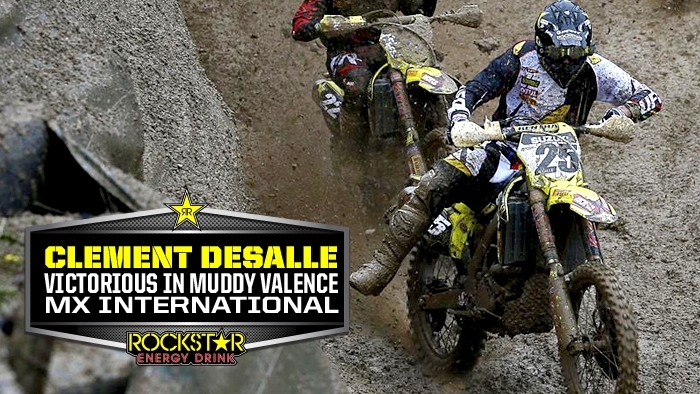 Rockstar Energy Suzuki World MXGP rider Clement Desalle raced to victory at the Valence pre-season International Motocross event in France today; the second of three international races the team will attend before the opening round of the World MXGP Championship at Qatar on February 28th. Team-mate Kevin Strijbos and Desalle set the fastest lap-times aboard their factory RM-Z450s in Saturday's free practice, held under semi-dry conditions, but today’s races were hit by constant rain that turned the circuit into a single-lined mudfest. Strijbos took pole position in the morning with a super-quick lap that was almost three-seconds faster than Desalle’s, but Desalle was the fastest out of the gate in the first heat; a race he convincingly won from start-to-finish from Strijbos. In the second heat, Desalle rounded the first corner in third position, but moved forward when Frenchman Gautier Paulin (Honda) made a couple of errors; and then after Xavier Boog (Kawasaki) took an outside line, the 25-year-old Belgian took the lead and held it to the chequered flag. Strijbos encountered a bouncing start gate, forcing him to work his way up from the middle of the pack and once behind Steven Frossard (KTM) he had to settle for fifth position as heavy rain made it impossible to pass. The team now rushes home to Belgium to finish packing the crates for the first Grand Prix of the season. But once the flight cases are packed, the team will head towards the International Motocross event at Mantova in Italy this coming weekend. Heat 1: 1: Clement Desalle (Rockstar Energy Suzuki World MXGP), 2: Kevin Strijbos (Rockstar Energy Suzuki World MXGP), 3: Xavier Boog (Kawasaki), 4: Shaun Simpson (KTM), 5: Filp Bengtsson (Honda). Heat 2: 1: Clement Desalle (Rockstar Energy Suzuki MXGP), 2: Xavier Boog, 3: Shaun Simspon (KTM), 4: Steven Frossard (KTM), 5: Kevin Strijbos (Rockstar Energy Suzuki World MXGP). Overall: 1: Clement Desalle (Rockstar Energy Suzuki World MXGP) 2 pts., 2: Xavier Boog (Kawasaki) 5 pts., 3: Shaun Simpson (KTM) 7 pts., 4: Kevin Strijbos (Rockstar Energy Suzuki World MXGP) 7pts., 5: Gautier Paulin (Honda) 12pts.